This is what I generally refer to as the Saga of Decker. I obtained my Mego Decker action figure one chilly morning during one of my many childhood visits to my godfather, all the way over on the east side of the Van Wyck. Yes, a trip consisting of a total 15 minutes from my home. Across the street from my godfather's place was a small general store. It was a cross between a hardware store and pharmacy from what I can remember. On occasion my mother and I would go there to pick up little things while my father visited with my godfather. On one such occasion, I noticed a spinner rack full of carded toys. Not much in the way of selection, but I did spot a Star Wars figure. There amongst the dredge was an Empire Strikes Back Han Solo! Oh boy, this was my chance to actually OWN a Star Wars figure. Finally I could shut up the jerk with the Bespin Luke. I grabbed Han Solo and as I was about to show my mom, I noticed a figure from Star Trek the Motion Picture. 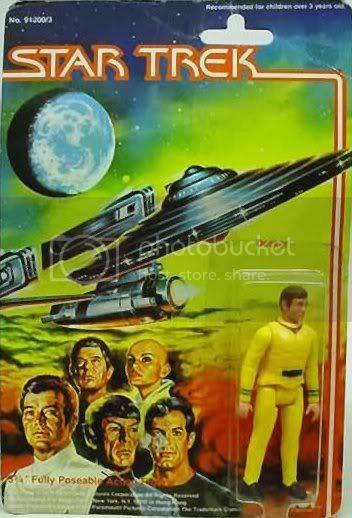 Being that I was about 4 or so, and as of yet unable to read, I thought it was Kirk. Well, I knew my mom was a fan of the show. I had caught her watching it on occasion. I figured, I bet she'd get a kick out of it, so I grabbed it to just LITERALLY SHOW HER. Of course it played as as follows: I carry two figures up to my mom who is talking to the guy behind the counter. I show her the Star Trek figure first. She takes it from me. I go to hand her Han Solo, and she puts it counter and says we'd better get back. Once across the street, I'm handed my new toy: Star Trek's own Decker. I guess in the confusion of her not paying attention to me as I tried to explain which I wanted and which I just wished to show, she misunderstood and just grabbed the first thing I handed her and paid for it. So there I was with my brand new "I don't know who the heck this is" Star Trek guy. I figured he was Kirk. So I called him Kirk. He became my new best friend, being that he was the only 3 3/4inch figure I owned at the time. (I had a previous relationship with a Comic Action Hero Penguin, but that ended badly... for the Penguin.) Still, Decker and me, we had lots of fun. Sometimes he'd wear a cape and fly like a superhero. Sometimes he'd put on a parachute and become a daredevil the likes of which had not been seen since Evel Knievel. One day, a year or so later, I was playing with the kids next door when one particular kid flung Decker high into the air... and he landed on the roof. Bye Bye Decker. A couple of more years go by, and the neighbors have their roof redone... and off the roof flies Decker. A little worse for wear, but still good ole Decker. Of course he's caught by the kid next door, who has experienced a bout of amnesia it seems since he claims Decker was his all along and that *I* threw him on the roof. His mother takes his side. Again, Decker seemed lost to me. But that did not last long. All it took was patience, and a little bit of the sneak, and Decker was back in my possession. Yes, I bided my time and when I saw the opportunity, I stole him from the kid next door. Granted since he was mine to begin with, I don't actually consider it "stealing" so much as I consider it liberating a POW. Decker was an indoor toy from that point on. He wasn't quite the same, the ravages of being behind enemy lines had left their scar. The kid next door was a toy biter. Decker came back from the front without any fingers on his hands, and missing a good 40% of his paint. But he was mine. I still have Decker. It's funny, for a figure I never wanted, he turned out to be a pretty good toy. What a great story! In the midst of trying to build collections of minty, shining-example toys, it's great to still have our battered childhood friends and all the memories associated with their wear & scars. That your colorful childhood story involved the poor, otherwise peg-warming Mego decker makes it all the more joyful!